Size O Code flag Set Includes: 26 Alphabet Flags are 1'x11/4', 10 pennants are 2/3'x2', and the 3 substitute flags are 2/3'x11/3'. Finished with nylon rope, distance lines and Ash Toggles. Set also includes a Handy Nylon Storage Bag. Size 2 Code flag Set Includes: 26 Alphabet Flags are 11/2'X 2', 10 pennants are 11/3'X 3', and the 3 substitute flags are 1'X 2'. Finished with nylon rope, distance lines and Ash Toggles. Set also includes a Handy Nylon Storage Bag. Size 3 Code flag Set Includes: 26 Alphabet Flags are 2'X 2', 10 pennants are 11/3'x3', and the 3 substitute flags are 11/3'X 2/3'. Finished with nylon rope, distance lines and Ash Toggles. Set also includes a Handy Nylon Storage Bag. 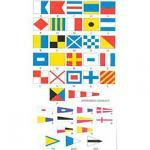 Size 7 Code flag Set Includes: 26 Alphabet Flags are 3'x3', 10 pennants are 2'x 4 1/2', and the 3 substitute flags are 2'x4'. Finished with nylon rope, distance lines and Ash Toggles. Set also includes a Handy Nylon Storage Bag.